I have divided my botanical work up into two pages for now, Fruits & Vegetables and Plants which both lie under this Botanical Work title page. Drawing and painting plants and flowers make up most of my work. I am drawn to bold subjects (sunflowers are a favorite) and love to work on small details. Botanical illustration does not just mean lovely flowers. I love to collect and work on pods, twigs, seeds, husks, roots, the detail of a leaf, the fruit of a tree. Although most of my work is watercolor, below is a ink and watercolor piece of the Osmuna cinnamonea, or Cinnamon Fern. Ferns make a graceful and interesting subject. Some fern species need to be identified by the sporangia - tiny clusters of pollen under each tiny pinnule. Here I have drawn the sporangia as it would look under the microscope. 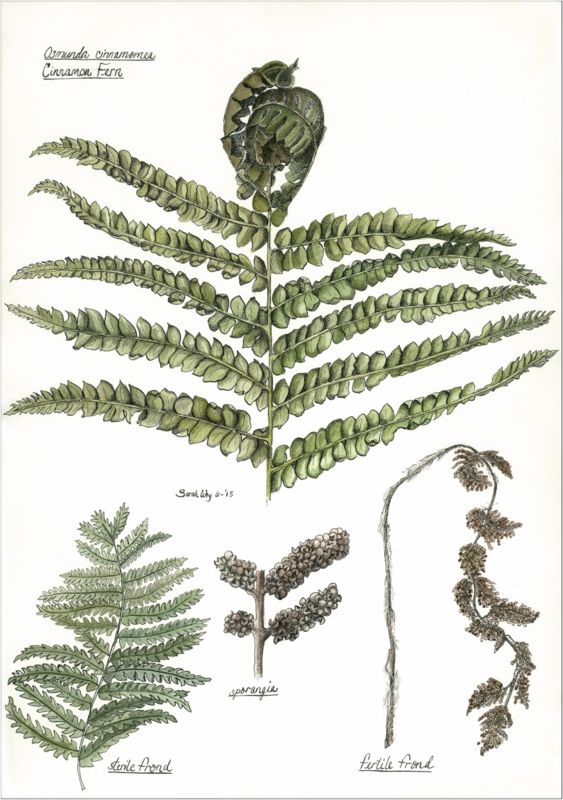 Scientific fern drawings include this detail as a key characteristic of the subject fern.